The Marine Mammal Center : Pelee the Sailor! 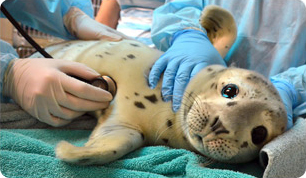 Pelee the Sailor Gets Some TLC at TMMC! Pelee makes his way onto a boat in Sausalito. On September 14th, 2011, this little male juvenile California sea lion, nicknamed Pelee meaning "pelican", was successfully rescued from Pelican Harbor near the Sausalito Yacht Club. Somehow, he managed to haul himself out of the water, up onto the adjacent boat dock and into this small boat! That was a lot of work for the pinniped, and since he was already weak and could not get out of the boat, a citizen called the Center for help. Pelee is one of 30 California sea lion patients on site at the Center on September 27, 2011. During the admit exam at the hospital, veterinarians noted that Pelee only weighed 45 kilograms or just under 100 pounds which is considered underweight for a 2-year old sea lion. In addition to being malnourished, his left hind area had some sort of injury and rescuers observed him tightly tucking his flippers underneath his body, often a sign of distress. A hole in his left flipper appears to be a missing identification tag-hole - evidence that he may have been tagged by scientists when he was younger and at a rookery area such as at the Channel Islands. After a series of blood and urine tests, Pelee was diagnosed with a mild case of leptospirosis and malnutrition, and is receiving a powerful protocol of fluids, vitamins and antibiotics. He already has begun to respond positively, and after just a few days under the Center's care, gained 3.5 kilograms or nearly eight pounds!